Prentice Hall Press, 9780735204515, 240pp. Successful persuasion is about reading your audience-of one or one million-and creating a message that aligns with what they already believe. As a message strategist for some of the most famous names in America, Chris St. Hilaire knows this better than anyone. He has taught politicians how to persuade voters, attorneys how to persuade juries, and executives how to persuade CEOs. *Persuade people without browbeating them. *Unite with your audience, not conquer them. *Use language that lets people agree with you on their terms. *Get people to see things your way and feel good about it. With provocative excerpts from focus groups and courtroom testimony, behind-the-scenes insights from some of the nation's canniest political operatives, and stories pulled from headlines and corporate hush files, "27 Powers of Persuasion" delivers tactics you can start using the moment you close the book. Lynette Padwa is the author of Everything You Pretend to Know and Are Afraid Someone Will Ask and the coauthor of several other books. She lives in Los Angeles with her husband and son. "...useful primer in how to become a more confident and skilled businessperson." "I'm enthusiastic about [St. Hilaire's] approach to persuasion, which is very simple, and which is fundamentally about positivity: making other people feel good about themselves makes them feel good about you." "27 Powers of Persuasion offers readers some powerful new ideas on how to get others to follow you." "St. Hilaire provides...interesting and useful methods for presenting ideas.... He's practical...though he very wisely recognizes how humans think and act. His anecdotes are apt and instructional..., and show how executives and others can present their thoughts in ways that are palatable to others without necessarily compromising or losing integrity." "In each chapter, St. Hilaire and co-writer Lynette Padwa explain a rule of persuasion, share successes and offer insight. This book is a valuable resource for current and future leaders in the workplace and beyond." "Chris St. Hilaire's 27 Powers of Persuasion is full of smart strategies to help you communicate more effectively. Take this book to heart and start winning people over right away!" "27 Powers of Persuasion offers a few "I knew that" moments, with even more "I should have known that" and "I wish I had known that" ones...Not even halfway through the book, I found myself employing changes to the method and manner by which I communicated with staff, clients, adversaries, judges, and the rest of the business world...St. Hilaire's methods flat out work." 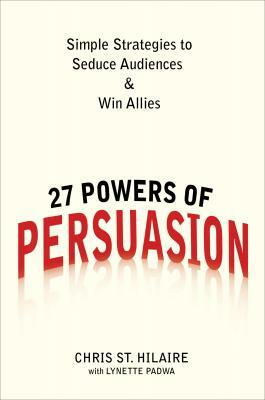 "Whether your audience is a voter, a consumer, or a juror, whether you're trying to convince a friend, a spouse, a son or a daughter, Chris St. Hilaire's 27 Powers of Persuasion has the answers you'll need to win people over." "Inspiring, thought provoking, a masterful tool for just about any industry. The entire book had me captivated from Power #1 through #27! I learned a little about myself as I read and adapted the chapters to my own business and personal life." "I hire Chris St. Hilaire for my most difficult trials, now you can use his 27 Powers of Persuasion at any time." -- David Batten, Attorney-at-Law, Cranfill Sumner & Hartzog; America's Best Lawyers: Category "Bet the Company Litigation"
"Everyone needs to understand the power of their own persuasion. Chris St. Hilaire's book gives readers in plain English the ability to succeed in 27 easy pieces." "Every trial attorney would be wise to put aside his or her ego and read this book. The advice in this book will change the way you present arguments, in court and out of court, and will make any attorney a more powerful advocate." "Utilizing the strategies in 27 Powers of Persuasion will make you a better, more effective communicator in business and in life." "Chris St. Hilaire's 27 Powers of Persuasion offers creative and powerful strategies I immediately put to use in guiding my board of directors through a series of challenging issues."